In our last blog post, Dr. Van Treese in Sidney, OH shared some vital information about dentures. Dr. Van Treese discussed what types of dentures are available as well as who might be a candidate for dentures. If you are in need of dentures, and believe you are a candidate, below is some information about the procedure you might want to know. – First, Dr. Van Treese will take an impression of your teeth and mouth. These impressions will be used to accurately manufacture your custom-made denture. – Next, you will be required to attend some visits to make sure the denture is going to be a good fit. – If you need to have teeth extracted, they will be removed at this time. – Dr. Van Treese will place a temporary denture for your comfort until your custom-made denture is complete. 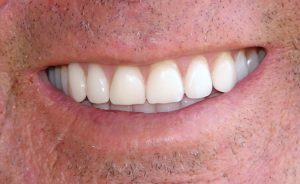 – Finally, after your custom-made denture is ready, your temporary denture will be removed and your permanent denture will be placed. After your procedure is complete, you may experience at increase in salivary flow, some tenderness throughout your mouth, and trouble eating and talking. Luckily, these side effects are nothing serious and will subside after you get used to your new dentures. Interested in receiving dentures? Dr. Van Treese is always welcoming new patients. Contact us today to set up your visit!